BJC Fellows across the country are actively standing up for our first freedom in their congregations, communities and careers. 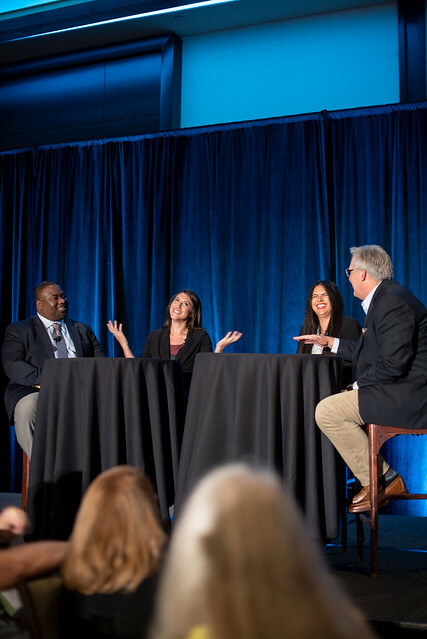 At this year’s Religious Liberty Council (RLC) Luncheon, hundreds of religious liberty supporters gathered to hear from members of each class of BJC Fellows, who shared their individual journeys and how they’re putting the BJC Fellows Program’s teachings to use in their everyday settings. Three BJC Fellows from the class of 2017 took the stage for a panel discussion moderated by the Rev. Dr. George Mason, pastor of Wilshire Baptist Church in Dallas. Joining him were the Rev. Aurelia Davila Pratt, lead pastor of the Peace of Christ Church in Round Rock, Texas; Sofi Hersher, assistant communications director of the Religious Action Center of Reform Judaism in Washington, D.C.; and the Rev. Corey Mitchell, a speech-language pathologist in Raleigh, North Carolina, and associate minister for children and youth at the Rock Spring Missionary Baptist Church in Creedmoor, North Carolina. Since 2015, the Baptist Joint Committee for Religious Liberty has selected 10 BJC Fellows each year, bringing them to Colonial Williamsburg, Virginia, for an intensive and interactive seminar. Members of the BJC staff, alongside other scholars and historical interpreters, deepen the Fellows’ historical, legal and theological understandings of religious liberty, thus equipping these young professionals to take action on religious liberty issues in their own communities and contexts. In Mitchell’s ministry work with children, he said his knowledge from the program has helped him communicate “tolerance” as well as “how to be accepting of peers who have a different faith background.” He reiterated that this concept can be especially difficult for children to wrap their heads around if they have met few people who differ from them – theologically or otherwise. Hersher agreed with both Mitchell and Pratt, noting that “the future of religious liberty is strongest in partnership,” referring to her own partnership with the BJC as a “beautiful” one. She offered a historical lens as well, reminding everyone that religious liberty can be a shared experience that is — unfortunately — often rooted in religious persecution. “Everyone in this room at some time and at some place on earth is a part of religion that at one point in history has been part of a majority and part of a minority,” she said. After the panel concluded, eight other BJC Fellows took to the microphones to share their insights and experiences as advocates. Incoming BJC Fellows — members of the class of 2018 — also shared their excitement about what lies ahead. The Rev. Brent Newberry of Worcester, Massachusetts, expressed interest in how the BJC Fellows program can help him better explore his own inter-religious community. “Our future is in the excellent hands of the BJC Fellows,” said BJC Executive Director Amanda Tyler, commending the next generation of religious liberty advocates during her remarks. She also shared an update on how many advocates from across the theological spectrum have recently worked together to make a difference. As the individual donor organization of the Baptist Joint Committee, the Religious Liberty Council is one of the 15 supporting bodies of the BJC. All BJC donors are members of the RLC, and the luncheon included the election of RLC officers and RLC representatives to the BJC Board of Directors. Lynn Brinkley of North Carolina and the Rev. Andrew Daugherty of Colorado were re-elected to new three-year terms serving as RLC representatives on the board, and Gary Walker of Florida and the Rev. Elizabeth Mangham Lott of Louisiana were elected to serve for their first three-year terms. Tyler thanked the Rev. Tambi Swiney of Tennessee and Aubrey Ducker of Florida for their two terms of service as RLC representatives. The crowd also re-elected the Religious Liberty Council Officers: Co-chairs Swiney and Aldape and Secretary Ashton Wells of Missouri, a 2016 BJC Fellow. The annual Religious Liberty Council Luncheon is held in conjunction with the Cooperative Baptist Fellowship General Assembly each summer, and it is open to anyone who wants to attend. Next year’s event will be in Birmingham, Alabama. Tickets will be available for purchase in spring 2019. To see more scenes from this year’s event and to watch a video of the entire program, visit BJConline.org/Luncheon. You can also search the hashtag #RLCLunch on social media for additional event coverage or listen to a podcast of the program. View a photo album on our Facebook page. This article is from the July/August 2018 Report from the Capital. The entire edition will be available online in mid-August. Inspired by these new leaders? Show your support for religious liberty by connecting with the BJC Fellows Program. Invite a BJC Fellow in your region to speak at your church or in your community about religious liberty. Contact Charles Watson Jr., associate director of education, for details at cwatson@BJConline.org. Don’t see a BJC Fellow in your area? Know a person perfect for our program? Suggest they apply! Applications will be available in December at BJConline.org/Fellows. Your contribution ensures the future of religious liberty advocates. Make your gift: BJConline.org/Donate.